The rain keeps falling. Here’s a traffic map as of noon our time today. 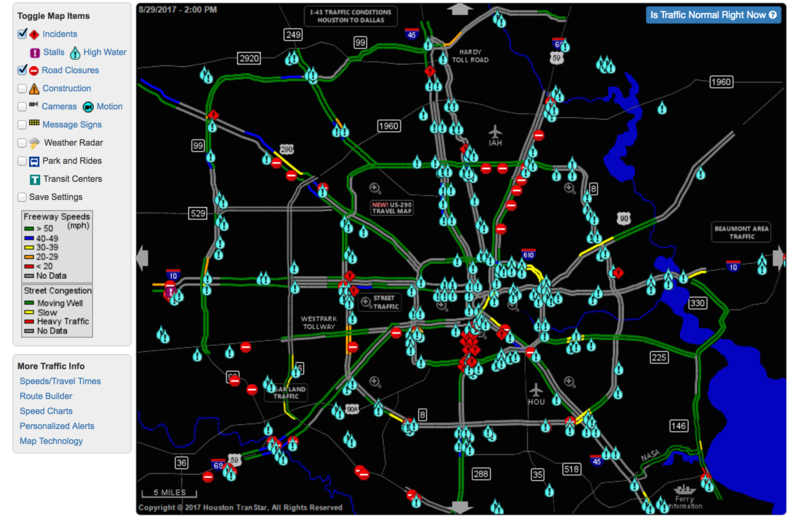 The Houston Metro has suspended regular service through Wednesday due to flooded roadways. Remarkably, the vast majority of people in Houston still have power — nowhere near the number that lost electricity during Hurricane Ike in 2008. The Houston Chronicle has extensive coverage of Harvey’s impacts on southeast Texas and neighboring Louisiana. I’d say most underpasses need lighting upgrades and more patrols, too. Many of them are good disincentives to walking anywhere — whether to transit or anywhere else. The court’s ruling, according to experts, might mean that local sales taxes could be approved by a simple majority instead of the current two-thirds required by Prop 218. For example, Measure M needed 66.6 percent ‘yes’ votes to pass last fall. It got 71.15 percent. And what does this mean in the real world? Not sure. Sales taxes in most of L.A. County are sitting at 9.25 percent and are higher in a few cities. With the gas tax increasing by 12 cents per gallon in November and vehicle registration fees increasing Jan. 1 — thanks to a bill by the Legislature and signed by Gov. Brown* — I’m not sure how many more taxes the public will tolerate, even if the spending is well intended or needed. *The bill is supposed to supply about $5.2 billion annually for transportation infrastructure and for transit agencies in California. UCLA assistant planning professor Michael Manville concludes that the potential benefits of congestion pricing — less traffic congestion, air pollution and better transit — would provide more benefits to low income people than the status quo. As some Metro Bike Share customers in Pasadena may have realized by now, the city hasn’t done much to supply good east-west bike connections (north-south isn’t much better, IMHO). This 1.5-mile protected bike lane project — if fully built — would provide a corridor between Old Pasadena, the Civic Center, the Playhouse District and end nearish to PCC and Caltech. I’d be interested to hear how the supreme court ruling impacts prop 13 with regard to the property tax cap. If changes to property taxes aren’t exempt from this ruling, it might be a good opportunity for local governments to shift some of the tax burden (especially for municipal services and infrastructure) from regressive sales taxes to more progressive property taxes. Seems to me that this would not be so hard a sell nowadays that the region is so much more renter-heavy than it used to be. Especially if it is put forward by local government, which can more easily be held accountable for how said revenues are spent than the state. If this allows local governments to reduce reliance on sales taxes, it would go a long way to reducing the incentives municipalities have to prioritize commercial development over residential. I would say that would be fine, except for one problem. That problem is if you raise property taxes, the Lanlorads are NOT going to sit by and do nothing, they will raise rents on those of us who are forced to rent for whatever reason. By all means punish the lanlords, who will in turn punish the renters, which will in turn mean that there will be even less housing,because lanlords/owners will withold units from the market and builders and investers won’t see any profitibility so they won’t build/invest. Mmore people on the streets because they can’t afford to even rent. IS THIS WHAT YOU REALLY WANT? Not saying its the right call for every municipality, or a magic bullet, but I also think its a mistake to assume we know what the effects would be at face value. I just think its something that would be worth further study to find out. There are a lot of other factors that could affect any impact on rents in particular and cost of living more generally. The current caps on property tax are huge incentives for municipalities to not allow homes to be built, opting instead for pushing for commercial development. There are two cases recently in the news where the city officials say as much explicitly. Redondo Beach (https://la.curbed.com/2017/8/17/16162566/redondo-beach-development-ban-mixed-use-moratorium) and Brisbane (http://www.latimes.com/politics/la-pol-ca-small-city-controls-big-housing-project-20170728-story.html). Aside from contributing to the housing shortage, building for jobs but not homes increases commuting costs (which disproportionately harms lower income people who are also more likely to rent) as people have to live farther away, and likewise puts a damper on pollution reduction efforts. Secondly, apartment landlords aren’t the only ones who pay property tax. Commercial property owners and home owners have been riding a huge wave of increased property values that they have cashed in on. With the surge in property values, a relatively small increase in property tax spread out over all these owners could still generate a lot of revenue for local governments. To soften the blow of potential rent increases, they should concurrently reduce their local sales tax rate (which also disproportionately hits lower income people), to put more money back in their residents pockets. Reduce the local sales tax rate enough, and you might even drive more business to your local stores. Facing higher property taxes, this might even push existing homeowners to stop blocking housing construction and spiking property values. Its easy to bask in your home doubling in value if you don’t have to pay a dime more taxes on that. If you start to get taxed on some of that windfall, maybe having more neighbors to spread that tax burden around starts to sound more attractive than maintaining “neighborhood character”. Currently tax payers are increased by building more retail, not housing. Switch over from sales tax to property, and its reversed. Like I said, there are a lot of complex, interrelated components, so I don’t think a simple cut and dry cause-effect explanation fits here, especially over diverse types of municipalities, but I really think its something worth investigating. Raising taxes is never a good idea! Before we raise ANY taxes, we MUST first insure that we eliminate all the corruption that is in our state and local governments. Think about how much money that will save!